The world’s largest democracy remains one of the most restrictive places for the press. 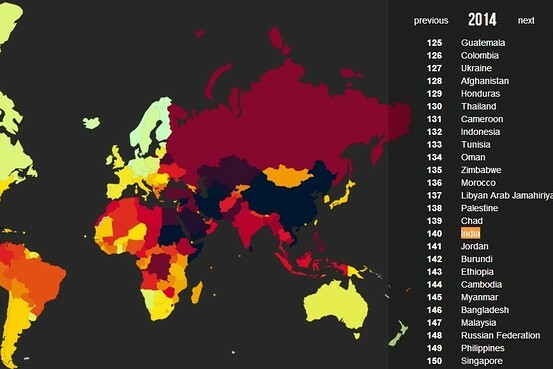 In a report published Wednesday, Reporters Without Borders, a Paris-based think tank, ranked India 140th out of 180 countries surveyed for the free speech it affords the media. This was a one-point jump from the country’s 2013 ranking, when it recorded its steepest fall on the annual-list since 2002. On Monday, acting on an agreement chalked out by a Delhi court, one of India’s largest publishing houses withdrew a 2009 book that reinterprets Hinduism, the latest instance of a book being removed from circulation in the country. The authors of Wednesday’s report singled out the insurgency in the disputed territory of Kashmir, where channels of communications, including telephone lines, satellite televisions and the Internet, are routinely suspended in response to unrest, as well as the killings of eight journalists in 2013, for India’s lowly press freedom ranking. The killings included those of Jitendra Singh, a freelancer in the eastern state of Jharkhand, who documented Maoist activists in the state, and that of Rakesh Sharma, a Hindi newspaper reporter who was shot dead in Uttar Pradesh, India’s most populous state, in August. The People’s Liberation Front of India, a naxalite group, claimed responsibility for Mr. Singh’s death in April. A probe into the shooting of Mr. Sharma is ongoing. “Those responsible for threats and physical violence against journalists, who are often abandoned by the judicial system and forced to censor themselves, include police and security forces as well as criminal groups, demonstrators and political party supporters,” the think tank said in the report. The Indian government has also been under fire in recent years for its clampdown on social media. India’s Supreme Court for instance is currently hearing a defamation suit against tech giants Google and Facebook, a case that’s been pending before courts since 2011. And in 2012, the government sought to block Twitter accounts of some prominent journalists and news organizations, arguing the content was stoking communal tensions. The same year, a Mumbai court charged cartoonist Aseem Trivedi, who likened the national Parliament to a toilet on his website, with sedition, a charge that was later dropped. These, among other reasons, led to India slipping nine places to 140th in Reporters Without Borders’s 2013 press ranking, which surveyed 179 countries. via India Among the Worst for Press Freedom – India Real Time – WSJ.